Are you buying a septic tank in the near future? Should you buy concrete or plastic? Not sure which is best for you? As there are different reasons for considering each type of septic tank, you should understand the advantages and disadvantages of each. Plastic septic tanks are very resistant to cracking, unlike concrete. As plastic weighs less than concrete, it is much easier to get a plastic septic tank into the location for installation. A plastic septic tank is more cost-effective than a concrete septic tank. Plastic septic tanks can be water-tight and corrosion proof. Plastic septic tanks tend to have lower effluent levels, which may be discovered after a tank is opened for pumping. If not installed properly, a plastic septic tank can "float" to the surface of the ground. Because plastic is such a light-weight material, it can be damaged at installation. When is a plastic septic tank appropriate? Plastic septic tanks can be the right choice when they are permissible in your state and when cost is a significant consideration. In the end, you must decide if a plastic septic tank is best for your project. Concrete septic tanks have higher effluent levels than plastic septic tanks. 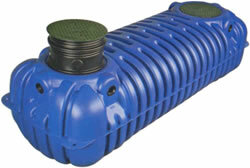 Because concrete septic tanks are heavy, there is no chance of floating, unlike plastic septic tanks. Concrete septic tanks are long lasting and extremely durable. These septic tanks are approved in all states. Concrete septic tanks are very expensive. These septic tanks can crack under extreme circumstances. Because concrete is heavy, it is very difficult to install. Though concrete septic tanks are very durable, they can crack and are more susceptible to leaks. When is a concrete septic tank appropriate? When concrete is mandated by zoning codes, concrete septic tanks are appropriate. Additionally, septic professionals choose concrete when value is a more important consideration than cost.